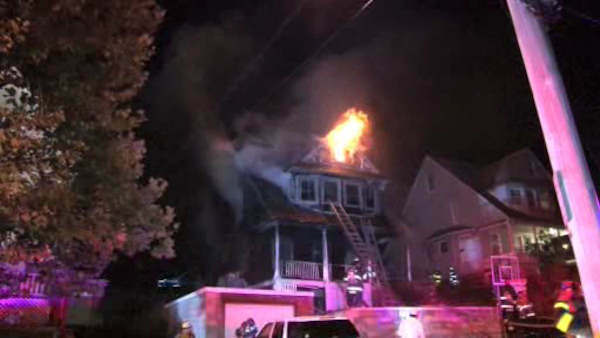 WHITE PLAINS, New York (WABC) -- Fire burned through a home in White Plains overnight Monday, forcing residents to flee onto the street. Several residents of the large Wyanoke Street house were treated for minor injuries in the fire that broke out just before midnight. The front of the house was fully involved in flames. Two adults and two teens from the house were displaced. One person visiting a neighbor said she believed she heard gunshots or fireworks just before the fire, but she wasn't positive. "My cousin...noticed that there was a commotion outside," Yessica Salazar said. "It sounded a lot like fireworks, maybe some shotguns. We all came out of the house...and as we were coming out, we realized that there was a huge fire." The cause of the fire is under investigation. The fire chief would not say if it was suspicious.